Prism Comics and the Cartoon Art Museum are proud to announce the opening of the Second Annual Prism Awards submission period! 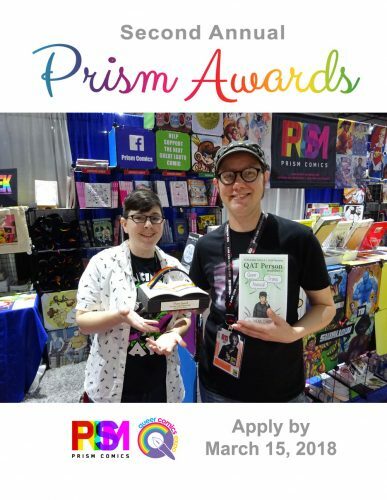 The Prism Awards are presented to comic works and queer authors that promote the growing body of diverse, powerful, innovative, positive or challenging representations of LGBTQAI+ characters in fiction or nonfiction comics. The goal of the awards is to recognize, promote and celebrate diversity and excellence in the field of queer comics. Three Nominees in each category for the Prism Awards will be announced on June 15, 2018. Winners of the Awards will be announced during Comic-Con International: San Diego, Thursday, July 19 – Sunday, July 22, 2018. All submissions will be reviewed by an impartial panel of judges made up of professionals in the field of comics, including authors, scholars, reviewers and librarians. BEST SHORT FORM COMIC – A self-published or traditionally published comic of 32 pages or less. Entries to this category should be a complete story, NOT an excerpt from a longer work. BEST WEBCOMIC – A comic that is primarily/initially published online. May be a complete or ongoing story. BEST COMIC FROM A SMALL TO MIDSIZE PRESS – A comic published by a self-owned, small or midsize press. BEST COMIC FROM A MAINSTREAM PUBLISHER – A comic published by a mainstream publisher. BEST COMIC ANTHOLOGY – A collection of shorter works created by at least four different authors, either self-published or traditionally published. All entrants must fill out the form online and provide an accessible link to the PDF of their submission. Each individual creator may submit up to 3 works for consideration. No submissions, except Anthologies, may be more than 32 pages. Each work submitted must be in a single PDF file. All submissions should have the title of work and main author’s name clearly visible on at least one page of the work. This year we are only accepting comics in English, as we are unfortunately unable to judge non-English language comics at this time. There is no entry fee for the Awards. No cash prize, travel, housing, or other in-kind services or items will be offered with these Awards. Winners and Honorees will be celebrated during Comic-Con International, Queer Comics Expo, and promoted online and in social media. About Prism Comics, the Queer Press Grant and Prism Awards – Founded in 2003, Prism Comics is an all-volunteer non-profit organization that supports LGBTQ+ and LGBTQ+ friendly comics, comics professionals and readers. Prism fosters diversity in comics and popular geek culture and is one of the only comics organizations that provides an annual financial grant to emerging comics creators – The Prism Comics Queer Press Grant. Learn more at prismcomics.org. About the Cartoon Art Museum – The Cartoon Art Museum’s mission is to ignite imaginations and foster the next generation of visual storytellers by celebrating the history of cartoon art, its role in society, and its universal appeal. The museum’s vision is to be the premier destination to experience cartoon art in all its many forms from around the world, and a leader in providing insight into the process of creating it. The Cartoon Art museum can be visited online at cartoonart.org and at its new location, 781 Beach St, San Francisco, CA 94109.